How might we celebrate and promote locally-prepared, lead-free Oaxacan heritage foods? | Eat.Think.Design. 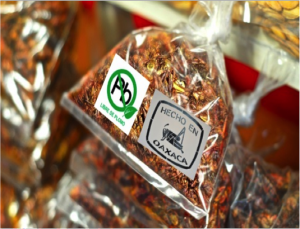 Home How might we celebrate and promote locally-prepared, lead-free Oaxacan heritage foods? How might we celebrate and promote locally-prepared, lead-free Oaxacan heritage foods? In Spring 2016, Cailey Gibson, Nnenna Udozi, and Jen Sisto worked with UCSF on a collaborative project to reduce the effect of lead-contaminated food gifts sent from Mexico to the Seaside, California community. Late spring to early winter is a memorable season for rural families in Oaxaca, Mexico. Early in the morning, men pick chapulines (Spanish for grasshoppers) from the farm and women cook them in the traditional glazed pottery stirring in lime and local spices. They are considered a delicacy for both urban and indigenous Oaxacan communities. For immigrant communities living far away in the United States, these delicacies can be a rare treat when they arrive in care packages. They bring forth memories of loved ones far away, and the colors, sights, and sounds of home. Food sent in care packages serve a vital role in maintaining communication across borders. But what if we told you that some of the food in these care packages contained a substance that could harm the health of everyone eating it? This is the situation facing a close-knit Mexican immigrant community in the town of Seaside in Monterey County, California. A few years ago, a nurse in Seaside noticed that Mexican children, specifically Oaxacans, were coming into her clinic with elevated blood lead levels. 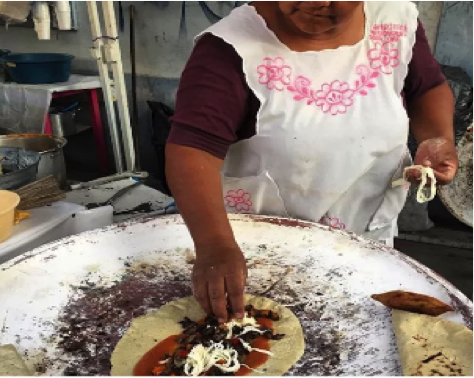 She reached out to researchers at the University of California, San Francisco and their team and discovered that there was lead in the food being sent from communities in Oaxaca to their relatives in Seaside. These products were delivered through non-traditional food importation distribution networks. The source of the contamination was lead-glazed pots. Despite the researchers’ best efforts, this problem persists. Our challenge was to figure out how to leverage the design thinking skills we had learned in Eat.Think.Design. to develop a solution that touched every community member from those who never eat Oaxacan meals to those who eat Oaxacan food every day. Thus, our guiding question was, how might we celebrate and promote locally-prepared, lead-free Oaxacan heritage foods? This question led us to the idea of hosting a community-wide cooking competition through which we would celebrate Oaxacan flavors and cooking traditions using lead-free cooking practices. With this solution in mind, we decided to first test our idea by leveraging existing resources in Seaside. Luckily, we discovered Seaside high school’s culinary art program, which is a program designed to transform students into culinary chefs. The Culinary Arts students at Seaside were provided with a basket full of ingredients and a recipe to make a popular Oaxacan meal: tlayudas. 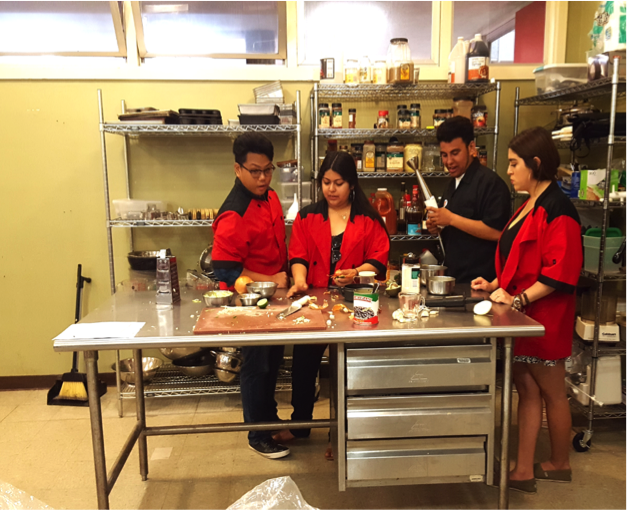 The students donned their red chef uniforms and got to work. They displayed abundant creativity and clever innovative ideas during this contest, often forgoing the recipe to throw in a dash of hot peppers or a handful of tomatillos to satisfy their own tastes. As they stood around the cooking stations, they shared food stories from home and some recounted their lifelong dreams to be a chef. There was no surprise that we found this prototype was successful and stimulated interest in preparing tasty Oaxacan food locally in Seaside. 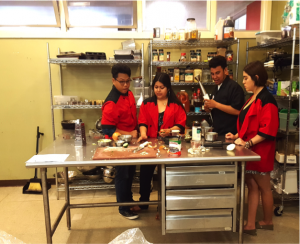 Through this pilot, we learned that framing the competition around healthy eating practices would be a positive message to include in scaling up a community-wide cooking competition. We envision an annual “Taste of Seaside” cooking competition that features heritage-foods and incorporates the colors, stories, cooking and family traditions of Oaxacan immigrants in Seaside. We dream of a multigenerational event for local chefs and community members that positions Oaxacan food as desirable and tasty not only by Oaxacans, but also others in the community. We believe this will increase the demand for locally-made Oaxacan food…..without the lead-glazed pots. From Flint to Detroit to Seaside, now is the right time to design creative solutions that tackle the persistent problem of lead exposure. We hope we’ve started this process in Seaside and are excited for our project partners to move the project ahead into its next phase: a community-wide Taste of Seaside cooking competition!